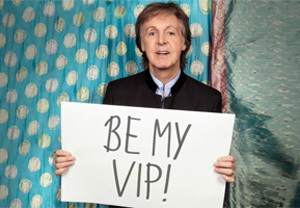 NEW YORK – The David Lynch Foundation today launched an exciting new campaign with the fundraising platform Omaze, partnering with music legend Paul McCartney to offer an exclusive, once-in-a-lifetime VIP experience at his September 21st show at Barclays Center in New York City. Starting today, fans can visit omaze.com/paul and enter for a chance to win a rare and extraordinary prize with a donation of as little as $10! 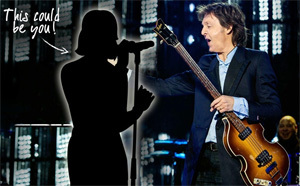 • Join Sir Paul McCartney for the unique opportunity to sing the iconic #1 hit Beatles song “Get Back” with him on stage in front of a VIP audience during a sound check before the evening show. • Receive 2 tickets and a VIP experience to the September 21 performance. • Be flown to New York and lodging in a 4-star hotel. All funds raised through this campaign will benefit the David Lynch Foundation (DLF), a 501(c)(3) nonprofit organization founded in 2005, which targets the epidemic of trauma and toxic stress among under-resourced populations through the implementation of the evidence-based Transcendental Meditation technique. DLF has served more than 500,000 children and adults worldwide, with a focus on urban youth in underserved schools, veterans suffering from post-traumatic stress and their families, and women and children who are survivors of domestic violence and sexual assault. DLF also works with the homeless, prison populations, people living with HIV/AIDS, and others. A limited number of tickets are also available for the David Lynch Foundation’s annual Festival of Disruption, curated by David Lynch, set for October 14th and 15th at the Theatre at Ace Hotel in downtown LA. The second iteration of this immersive festival will unite Lynch’s favorite creatives across disciplines and genres for a unique lineup of musical and artistic performances (including Bon Iver, TV On The Radio and The Kills), talks, film screenings, art exhibits, meditation sessions, and more, with the entire weekend raising consciousness and funds for the David Lynch Foundation. To purchase tickets, get additional information on the work of the Foundation, or subscribe for news about DLF programs, concerts, and events, visit www.davidlynchfoundation.org. Omaze is an online fundraising platform that makes giving fun and easy by offering once-in-a-lifetime experiences and exclusive merchandise in support of critical causes. Our campaigns connect influencers, nonprofits and donors to create lasting impact, and have raised funds and awareness for more than 200 charities with donations from over 175 countries. Click here for more. This entry was posted in Out & About on August 22, 2017 by admin.